Younger, Dancier and Headed for a Sell Out? Home » Music » Younger, Dancier and Headed for a Sell Out? The Maha Music Festival announces its 2016 lineup. A few people have asked what I think of this year’s Maha Music Festival line-up, which was announced last month. The bottom line: It doesn’t matter what I or anyone else thinks of the line-up as long as it sells tickets. This isn’t an art show, it’s a rock concert, and the decisions made by the talented board of Maha, while taking into consideration the quality of the bands and their music, very likely also considered how well the bands would draw. What are the bands’ “metrics”? How well does the band do in Spotify? How many Facebook fans does it have? What is its track record at other festivals? How big is its YouTube presence? Does the band have strong “buzz” — whatever that means? And so on. Add to all that this very important question: How much will it cost to book the bands? If someone were to ask me to curate a music festival, two things would happen: 1) Either virtually no one would show up, or 2) The bands would cost well north of a million dollars. In the first instance, while I’d select bands respected in the indie community, they would likely be unknown beyond the 300 or so who are ensconced in the local indie music scene, or I’d select bands like Beck or Arcade Fire or LCD Soundsystem that demand a bazillion-dollar contract. Either way, my festival would lose money. So, no it doesn’t matter what I think of the line-up. Or what some snobby guy or gal who’s really into garage rock or ’80s ambient bands or obscure Euro-dance acts or ancient glam bands thinks, especially if that guy or gal has never bought a ticket to past Maha festivals. What matters is that the thing sells tickets. And this line-up looks like it’ll (probably) sell a lot of them. Passion Pit is this year’s headliner. I saw them perform at South by Southwest early in their careers, back when frontman Michael Angelakos and his band were still lost in the blur of acts that sound like Vampire Weekend and Phoenix and MGMT. I didn’t keep up with them, other than noticing their song “Take a Walk,” was turned into a Taco Bell commercial. I couldn’t tell you the name of their last album or if a local radio station plays their music. But I assume they have very strong “metrics” or they wouldn’t be the headliner, and lo and behold, taking a look at their Spotify numbers, their 10 “popular” tracks in Spotify have a total of just under 300 million plays. Grimes, who is sort of a co-headliner at Maha this year, has a lot fewer Spotify plays. Her top-10 tracks have a total of just under 100 million plays. I also seen Grimes perform at SXSW a few years ago, right around the release of Visions, her 2012 breakthrough album. She played on top of a parking garage a few blocks north of 6th St., a performance that consisted of her standing behind a laptop computer with a guy playing guitar. I assume she’s picked things up a bit since then. 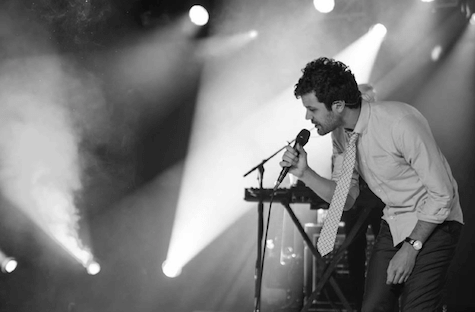 Passion Pit, who started out on Frenchkiss Records, is now a major-label (Columbia) pop act that plays a glossy style of dance music. Grimes’ last album came out on respected large-indie 4AD Records. I personally wouldn’t consider either of them dance bands, but that’s what they’re being marketed as, and clearly more people will be dancing to them then, say, Deathcab for Cutie, last year’s Maha headliner. Matthew Sweet and Jay Farrar appear to be nods toward the older Maha fan. Sweet has a rich back catalog and is from Lincoln. Farrar, a former member of Uncle Tupelo, is known for his work in Son Volt, and will be playing that band’s album, Trace, which came out more than 20 years ago (Matthew Sweet’s Girlfriend album was released 25 years ago). I literally heard the name Vince Staples for the first time in conjunction with Maha. I’ve heard not a single note of his music, but when it comes to modern hip-hop, the only games in town for me are Kendrick and Kanye. Part of the fun of festivals is being introduced to new music. I’d never heard of Matisyahu prior to his appearance at Maha a few years ago (and, honestly, haven’t listened to him since). Then there’s The Joy Formidable, a London-based alt rock band that records on major labels Atlantic and Warner Bros. What can I say, I’ve only seen or heard them on TV. As an indie music fan, they’re out of my wheelhouse, but I’m looking forward to hearing them live. Then we come to the festival’s sweet spot, for me, anyway. Car Seat Headrest, Diet Cig and See Through Dresses are young, important indie rock bands, all of whom have played before in small clubs in Omaha. CSH recently played at Lookout Lounge. Diet Cig was scheduled to play The Slowdown the first week of May and STD is, of course, local heroes who are breaking nationally. These are the bands I’m most excited to see. Combined, they probably couldn’t sell out The Waiting Room, so hats off to Maha for taking a chance on them. The other locals, Josh Hoyer & Soul Colossal and CJ Mills, uphold Maha’s fine tradition of booking quality local acts, though it seems Maha books fewer and fewer local bands as the festival grows. Finally, Diarrhea Planet is band I’ve seen perform in Austin, years ago. Back then they were sort of a power-pop-punk act. Their novelty-flavored name will raise eyebrows among the Maha sponsors, but, let’s face it, their name is their most offensive attribute. The buzz before yesterday’s announcement was that Maha is reaching toward a younger, more dance-loving audience. Maybe, maybe… I don’t view any of the bands on the bill to be dance-focused acts, though they certainly have a more lively beat to their music than some of the previous Maha acts. As for skewing “younger,” how is this line-up skewing any younger than last year’s bands like Alvvays, Speedy Ortiz or Purity Ring? Will it sell out? We’ll have to wait and see, though if it does, demand for tickets likely won’t be much higher than last year’s sell out. Maha seems to be settling in on Stinson Park and a sub-10,000-sized audience. And there’s nothing wrong with that. The Maha Music Festival is Saturday, August 20, noon to midnight at Stinson Park in Aksarben Village. Tickets are $55 for general admission; $185 for VIP packages. For more information go to mahamusicfestival.com.